This morning as I was in the shower (the fountain of all good ideas), I was thinking about "Art As Meditation." One of the three key principles of the Source Painting™ workshops I facilitate is that Art can be a practice, much like meditation, that brings us into the present moment and helps us "unhook" from repetitive thought patterns. Whether you are sitting on the meditation cushion or standing at a blank piece of paper with a dripping wet paint brush in your hand the ultimate task is the same: a deep dive into WHAT IS. And in that moment of truth each of us "meditators" is faced with a decision: are we going to GO FOR IT, or are we going to play it "safe"? Source Painting™ is a depth oriented transformational painting process I have trained in, practiced and facilitated for the last 15 years. It is the cornerstone of Juicy Creatives Studio. Recently in my Wednesday morning Soul Lab group at Juicy Creatives Studio, by way of introduction, I asked each person to express what they come here for. A common theme unfolded that I can summarize as "The amazing experience of being me!" Not in a self-centered or narcissistic way, but many expressed that the reason they come, and come back again and again, is to experience their own unfolding, a kind of tapping-in-to-the-depth-of-themselves-with-wonder, that lasts the whole rest of the week. There was an unspoken "It" that each person described wanting and finding in the process of creating. I would translate that "It" as an experience of True Self. What I see live in the studio is the desire to be a "good" artist is the one notion that will stop someone dead in their tracks from having a genuine enlivening encounter with painting. The same is true in meditation, as any Zen master will tell you, "Don't try to be GOOD at this, just DO it." The problem, especially in our goal-driven culture, is that any of our ego desires to achieve something often get in the way of drinking in the life-giving JUICE of the real experience. It is the rush to the role that ultimately winds up serving the ego instead of the True Self leaving us searching and wanting for the missing "It." Local Musician John David Brosius "Goes For It"!! What if we were allowed to paint without a plan, without formal training? What if our egos could allow us to experience something and let it unfold and develop in its own way for the sheer breath-giving joy of discovery? What if that leads us through doorways inside where old feelings could surface and integrate and new thoughts, CREATIVE thoughts, about our life and problems spontaneously begin to bubble up? This is what Source Painting™ is ALL about! Because the thing is, when you go for it in the painting meditation you tend to start going for it in life! 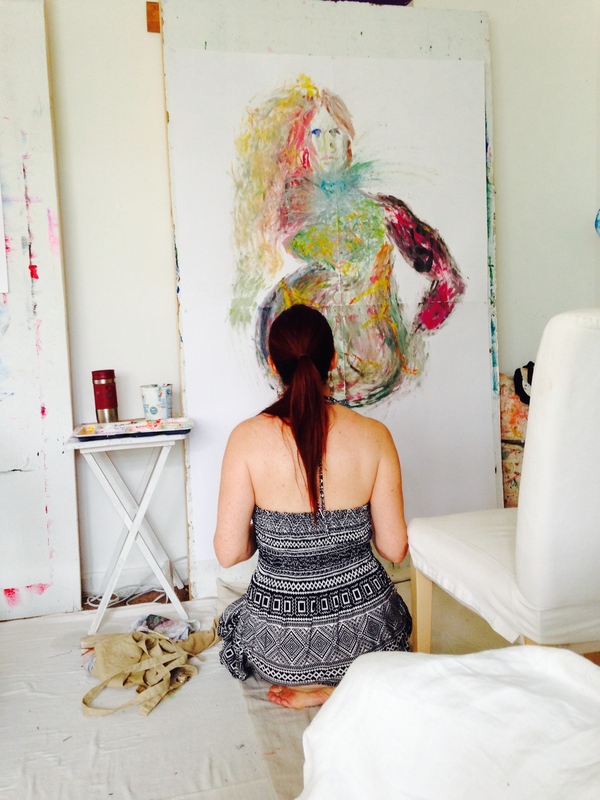 Please enjoy these pics of "Painting Meditators" going for it at Juicy Creatives Studio!! And in the next blog, I will explore the Personal Growth that ensues from using Art As Meditation with personal stories of mine and my students. Tracey Warford EMBRACING THE PROCESS and Going For It! Maria—always willing to Go For It!! Sometimes the Source Paintings™ get really big when you Go FOR IT!! A whole other painting sometimes opens up when you Go For It!! Going for it—with VIBRANT COLORS!! Elise Crohn owner of Juicy Creatives Studio--definitely GOING FOR IT! Are you ready to go for it? ?